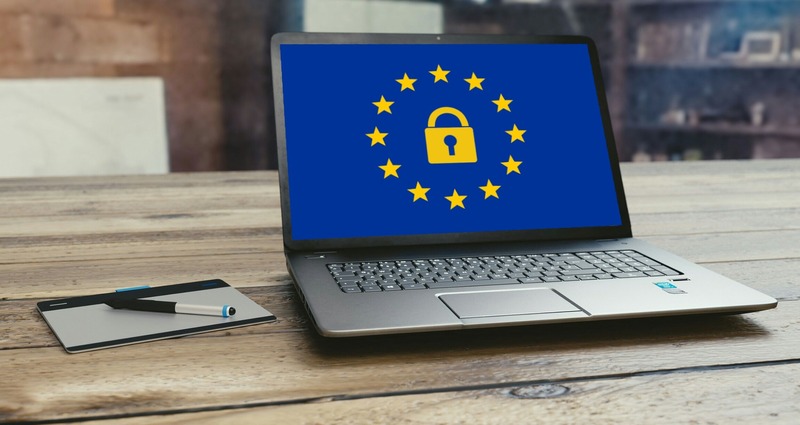 Whether you are required to be compliant with the European Union law on data protection and privacy (General Data Protection Regulation or GDPR), other privacy protection laws such as The California Online Privacy Protection Act (CalOPPA), you would like your company to get ahead of the curve with respect to privacy acts as a best practice, or have a client that does, Salesforce has implemented an Individual object to help you keep track of an individual’s data privacy preferences. Customizing and using the Individual object according to your business will help you on your journey to honor your customer’s wishes regarding how their data is stored and used, and when it needs to be deleted. The Right to be Forgotten applies when a customer no longer wishes for you to retain data about them, you no longer have a legal basis for processing, or when it’s no longer necessary to keep their data. 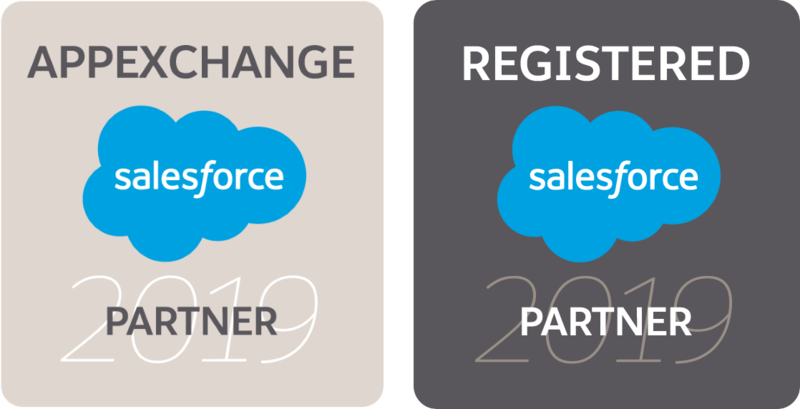 One person (Individual) may have multiple records within your Salesforce instance that contain personal data such as Leads, Contacts, Person Accounts, or User. An efficient method is needed to find and delete the Individual and/or all of its related records. Tip: Set up your org for success. Ensure that all of the person’s Lead, Contact, Person Account, or User records are related to the Individual record by automatically relating them with Lookup Helper. There are a number of ways to delete data from Salesforce, some of them have their limitations and some are more difficult to use than others. Using Storage Helper is an easy, safe way to mass delete records tied to an individual. Let’s walk through deleting Individual records and/or their associated Lead and Contact records. Before you get started, it is a good idea to determine the criteria that Storage Helper should use for record deletion. In this use case, we will be using the “Forget this Individual” field flagged true as the only criteria. Checking this flag could be accomplished in a number of ways, including using Rollup Helper to rollup the checkbox from Leads, Contacts, or other child records that meet the requirements you define. If you wish to retain Individual records, but delete the related child records, please see Delete Child Records Only below. If you haven’t already done so, install Storage Helper from the AppExchange. Name the job something meaningful. Check the “Hard Delete” field if you do not wish for the deleted records to be sent to the Recycle Bin. Leaving the flag unchecked may be the safer option in case you have incorrect criteria and are not using Storage Helper backup functionality. Note for compliance, after verification that the correct records were deleted, you will need to empty the Recycle Bin to completely remove the data from your org. Please note that the Recycle Bin’s capacity is limited so it is possible to delete more records than your Recycle Bin can hold. Using one of Storage Helper’s backup options is HIGHLY recommended, the backup files can be deleted, then removed from the recycle bin after confirmation that the correct records were deleted. 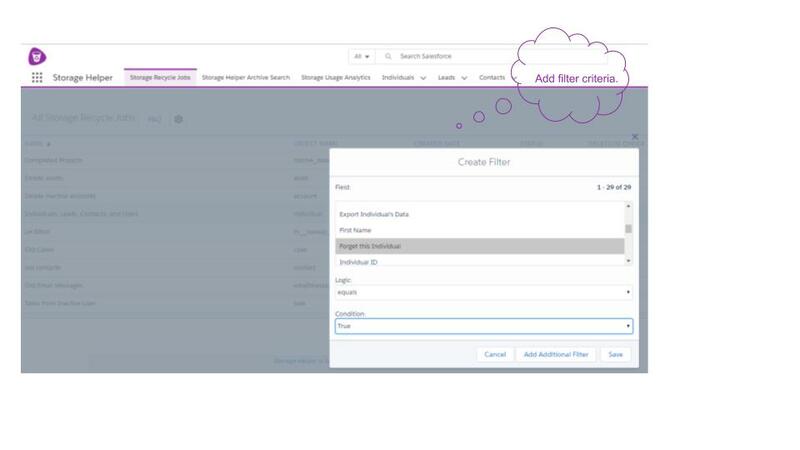 Preview the records to be deleted to ensure your filter criteria will produce the desired results. Select Backup options. Ensure that you are compliant with requirements regarding backing up personal data. Storage Helper will provide a .csv file of the backed up data that will either contain data from all of the fields on the records, or only select fields depending on the option you choose. Contact your company’s legal advisers for any questions regarding backing up personal data. 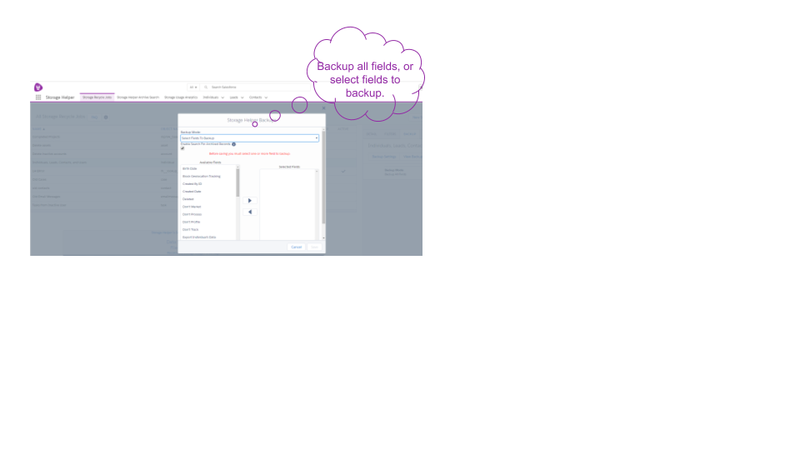 If you find that you are able to retain data that is not personally identifiable and would like to do so, you can use the option to backup select fields. Alternatively, you could back up all of the fields and then delete the data you do not wish to retain from the .csv file. NOTE: If you wish to completely remove the data after verifying the correct records were deleted, you will need to delete it from any .csv files that you have downloaded, delete the .csv from Salesforce, and remove the file from the recycle bin. 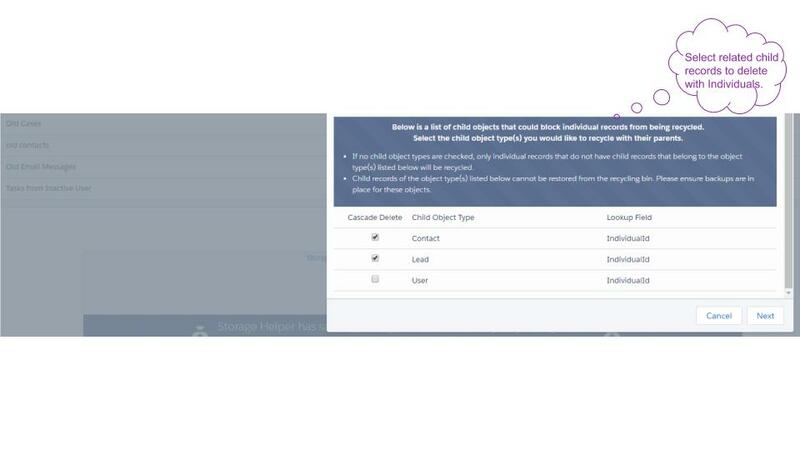 Select Backup Select Fields, and optionally select to enable Storage Helper Archive Search. 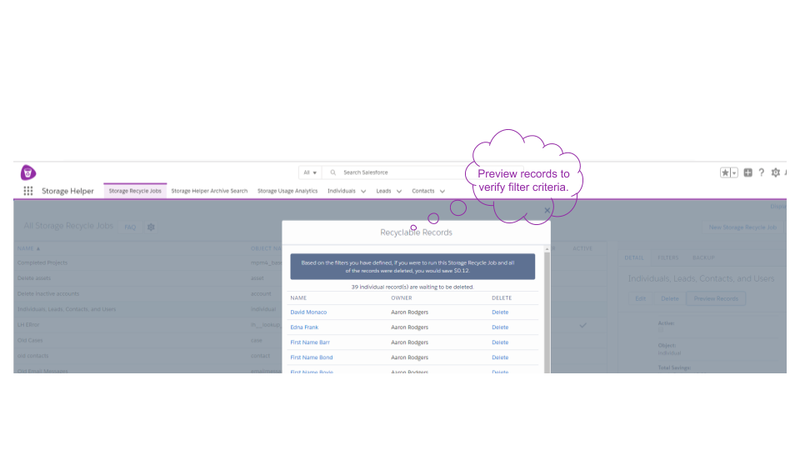 Storage Helper Archive Search enables you to reinstate specific records to your Salesforce instance by searching for the record from the .csv file and loading it back into your org with the click of a button. Select all fields you would like to backup by moving them to the box on the right and click save. Once you have verified that the deletion criteria is accurate and have selected desired backups, Activate the Storage Recycle Job. Clicking the manual run button will allow you to delete all of the records in your org that match the criteria you defined. 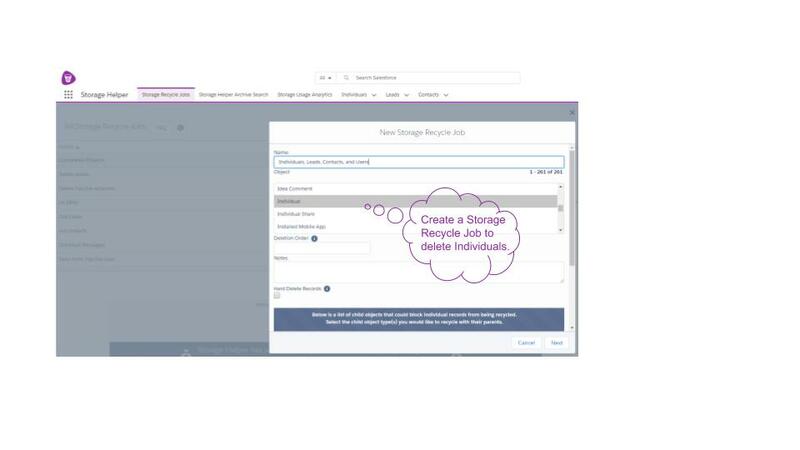 Optionally, select a run mode for Storage Helper to run your active Storage Recycle jobs on a defined schedule, or after your regular Salesforce Data Backup. Check the “Hard Delete” field if you do not wish for the deleted records to be sent to the Recycle Bin. See, “Leaving the field unchecked” above for more information. Follow steps 8 - 11 above in the detailed use case above. Need further assistance setting up your use case? Schedule a free One-on-One Work Session!